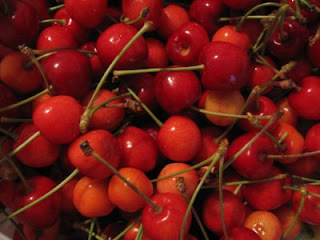 I came in from mowing the lawn this evening to discover hubby in the kitchen sorting through a huge bag of cherries. Apparently the Cherry Fairy (aka L from Sleeping Cougar Acres) had been by while I was in the back yard. When I was at the farm on the Friday she had mentioned picking cherries this weekend. She didn't think they were quite ripe, but there had been a raccoon in the tree taunting her dogs and stealing cherries Friday morning. She wanted to harvest the fruit while there were still some left. As I wasn't going to be there to help pick, I didn't think I was going to get any. What an awesome surprise to come in from my yard work to find she had left us 3 3/4 pounds of cherries. They taste wonderful in spite of her concerns about ripeness. Now we have to figure out what we're going to do with the ones we don't eat right away. If there are any left of course. Suggestions? Here is a few suggestions:You could bake a cherry tart, cherry muffins or a cherry cobbler. Brandied cherries(good over ice cream), cherry sauce,jam or just freeze them. Thanks for the suggestions. I like the idea of cobbler or muffins. I've never been good a the pastry thing. I'll see what I can find for recipes. Thanks Bookgirl. I don't know how I missed it. I looked at the print and the online flyers. Guess I had other things on my mind. I'll go drag it out the the recycling now before I forget!